Director – Rob Spera, Screenplay – Doug Hall & Jon Huffman, Story – Doug Hall, Rob Spera, Alan Reynolds & William Wells, Producers – Bruce David Eisen, Darin Spillman & Mike Upton, Photography – Michael Mickens, Music – Nicholas Rivera, Music Supervisor – Joel C. High, Visual Effects – Encore Visual Effects, Makeup Effects – Gabe Bartalos, Production Design – Nalia. Production Company – Trimark. Three youths from the hood want to make it big as a hip hop band. They are given a chance by rap producer Mac Daddy who then withdraws his offer after they refuse to promote aggressive, crime-breaking lyrics. They need to get money for the equipment for an upcoming audition and so decide to break into Mac Daddy’s house and steal from him. However, Mac Daddy has the leprechaun’s remains in a glass case. They bring the leprechaun back to life when they take the locket that imprisons it. Hunted by both Mac Daddy and the leprechaun, they try to stay alive and make it to the audition. At the same time, Postmaster P finds that the golden flute they took from the leprechaun has a strange hypnotic effect on people. 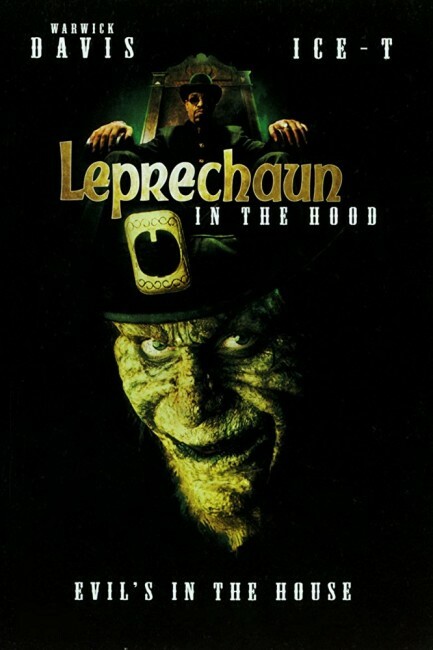 Leprechaun in the Hood was the fifth film in the series begun with Leprechaun (1993). (See below for other titles in the Leprechaun series). The previous Leprechaun films featured Warwick Davis as a malevolent leprechaun dispatching people with OTT regard. All of them, particularly the third and fourth entries directed by Brian Trenchard-Smith, tend to the awful. The best news about Leprechaun in the Hood is that it is the best of the series, indeed the first of the series that is in any way good. In a bizarre conceptual crosshatch, the series has been turned into a hip-hop film. (As is obligatory for a gangsta film, it features rapper-turned-actor Ice-T). The surprise is that the film actually plays the premise straight and has a serious story about three young guys from the hood trying to make it as a hip hop act but getting into trouble along the way. The film takes place in a world of ghettos, gospel churches, hip-hop/rap, gang-banging and drag queens. 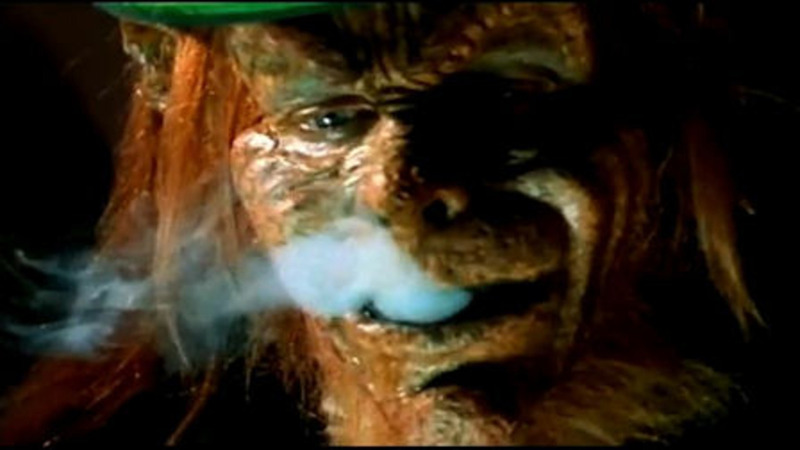 The previous Leprechaun films were centred around the set-pieces of the Leprechaun’s campy dispatches, tied together with the nominal raison d’etre of him re-collecting his gold coins. Here the leprechaun is almost a supporting character – indeed, when Warwick Davis does turn up and do his campy thing, he tends to drag down what is otherwise a reasonable film. When one of the lead characters is killed, the effect is tragic, not a campy novelty dispatch. Of course, the film lets the customary campiness have its head at the end. The results are hilariously tongue-in-cheek – the boys’ plan to deal with the leprechaun involves them going into his lair in drag posing as hoes and fooling the leprechaun into smoking a joint made out of four-leaf clovers. The end credits with Warwick Davis and the zombified hoes dancing the leprechaun rap has to be seen to be believed. The other Leprechaun films are:– Leprechaun (1993), Leprechaun 2/One Wedding and Lots of Funerals (1994), Leprechaun 3 (1995), Leprechaun 4: Leprechaun in Space (1996), Leprechaun: Origins (2014) and Leprechaun Returns (2018). Leprechaun: Back 2 tha Hood (2003) was a sequel to this.